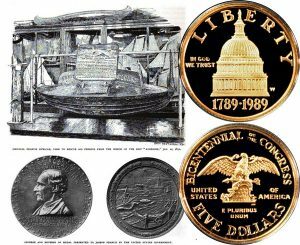 Today, the Congress Commemorative Gold Five-Dollar Coin remembers when America finally recognized Joseph Francis and his invention of the life-car on April 12, 1890. Joseph Francis was the inventor of the life-car for saving people from shipwreck, was the founder of the Life Saving Service of the United States and other nations, a service which has been the means of rescuing thousands of men and women who have faced death in one of its most terrible forms — and was the inventor of over a score of life-saving or life-protecting appliances. When a small boy, he lived on the sea-coast of Massachusetts; and it must have been that he had an unusually powerful mind for a little boy, and a remarkably keen appreciation of the dangers of the sea, for it was a singularly heroic resolve in one so very young to give up his life to saving the lives of others. At twelve years of age he had made a life-boat, the first real life-boat for the rescue of shipwrecked people, so it is believed, in the history of the world. He made it as most coast rowboats are made, save that he adjusted a lot of floats to the interior of the bow and stern in such a way as to give it great buoyancy. And so, in boyhood, he had begun the work with which he was closely associated for over three quarters of a century, a work whose results have entitled him to a monument as splendid as any ever erected to the memory of a benefactor of the race. The boat which he made was a rude, rough affair, but proved its seaworthiness on its first trial. Even when full of water, it would safely support four grown men, the buoyancy of the floats making it impossible to sink the boat by any ordinary means. The boy was poor; he had neither father nor mother; he had no powerful friends; he had no capital but his health and his brains; and yet he had something better than wealth, better than powerful friends, better than all that proud governments could bestow: he had a purpose. From the day that on the bleak Massachusetts coasts he made with his own hands that crude, life-saving boat until he died, honored by the nations of the world as few civilians were ever honored, it was his one splendid, over-mastering purpose to do good to humanity. He was a born inventor. The sea was his field, human lives in peril his opportunity. And so he kept on making all sorts of boats — now a light and fast rowboat for which, in 1819, he received “honorable recognition as an inventor” at a fair held in the Massachusetts Mechanics’ Institute in Boston; now an improved wooden life-boat which long afterward, in the year 1840, rescued the passengers and crew of the British bark “Belinda,” disabled in mid-ocean, a passing vessel having on board the rude but seaworthy boat which the boy had built in 1816 — twenty-four years earlier. A number of wealthy gentlemen in New York city founded the New York Boat Club in 1830; and for them Mr. Francis built the first yacht ever constructed in America. He was able, you see, to turn his hand to almost anything which had to do with sailing on the sea. Some Canadian gentlemen wanted a racing rowboat to beat the boat of some of their friends from England who were coming over from the motherland to give them battle at Quebec. Mr. Francis was called upon to build the boat. It was of mahogany, brass fastened, and it weighed only sixty pounds, a remarkably light racing-boat for that day. It was four-oared and was thirty feet long. They called it the ” Eagle,” and it well deserved its name, for it won the race against the crack boats of the English. It was the first rowboat for racing purposes ever built in America. But such work as this, successful as it was, was only what we might call amusement — there was far more serious work to perform. From 1830 to 1840 the young man was spending all his spare time and money at work upon a boat which should not only save lives but which could not be crushed on the rocks when the waves were hurling themselves shoreward. His cork-lined boats were successful, and were giving him a world-wide fame as an inventor and philanthropist; but he felt that unless he could invent a boat of some other material than wood his object was but half attained. He resolved to try iron. Those of his friends who knew of this step looked upon him — as many an inventor is looked upon in our own day — as little less than a lunatic. Iron for a boat? Why, it would take such a vast amount of wood to float the iron that it would be impossible to propel the boat — to say nothing of having it breast the waves of a furious gale and go out through the storm to a wrecked ship! The idea, they said, was simply preposterous. The young man acknowledged the apparent force of the argument, but he believed there was a way out of the difficulty. He started in the path alone. He found many cruel and disheartening difficulties in the way. but he bravely met all trouble, and he nobly maintained his high purpose, and won at last a magnificent victory, not only for himself but for all mankind. In his later years Mr. Francis loved to tell of the trials of that critical time. Amid his later honors he never forgot the days when at one moment he seemed so near to success and at another so near to the saddest of failures. It was now the year 1841. He had taken his family — for he was married — to a country place where they could live more cheaply than in the city. He had the use of a room in a house on Anthony street, in the city of New York, in which to carry on the work of his inventions, by the favor of Myndert Van Shoick, a gentleman who was much interested in the outcome of the matter. Here, shut in from all the world, in sore poverty, he worked for twelve months, a long, discouraging, weary year. The end to be gained was to make iron float on water, something which his best friends thought the dream of a lunatic. Day by day and night by night he worked ceaselessly. He denied himself all luxuries, all comforts. He met with failure after failure. He found himself one day at the close of the year reduced to actual want — and his object not attained. He had but a pittance in his pocket. He was hungry, but he needed one more piece of iron to make one last supreme effort. He went out to a junk-shop with his last twenty-five cents. He bought his piece of iron for thirteen cents. With the rest of the money he bought bread and molasses. All that night he worked. In the morning he found that the rats had stolen the piece of bread which he had saved for his breakfast, but the labor of the night had brought victory. He had solved the problem! He had conquered in the fiercest battle of his life. He had achieved the success he sought, and this victory meant the saving of the lives of many thousands of his fellow-men. The corrugation of iron, forming ridges in lines along the sides of the boat, had been invented. By this he was enabled to make the iron float, for he could bend it and shape it to the curved form of a boat, and the bendings or ridges in the sides took the place of all stays, supports, ribs, and timbers, furnishing in themselves the support and strength, while nothing was added to the weight. The metal was put under great pressure to do this, but it stayed in place, and the victory was won. He had been planning for several years for a life-car, a closed vessel or covered boat, which could be sent out to a stranded vessel on a rope and pulled back and forth. It was to carry two or three people. He could not see his way clear to make this of wood; but now the iron problem was solved, he could carry out all his plans. The car was built according to the plan made by him, an enclosed, torpedo-like affair, and along in the terrible winter of 1849-50, it was placed in the care of some untrained fishermen on the New Jersey coast, at Squan Beach. An English ship, the “Ayrshire,” was wrecked here, one day, in the midst of a blinding storm. The men on the beach could do nothing with their ordinary boats. The life-car was brought out. A small cannon, or mortar, was loaded with a piece of smooth iron, several inches long, attached to a pile of cord. This was shot out over the spars of the ship. The people on board hauled in the cord and drew along through the surf a stronger rope. This was fastened to the mast and the life-car was swung from the beach, with the rope running through the two rings at each end, and pulled out to the vessel. There were 201 people on board, and all but one of the number were saved. The story of their rescue went round the world. All that had been said in praise of the inventor’s powers was now justified. All Europe was interested. He was recognized by the nations of the world as one who had done a marvelous work for humanity — who had, as someone said, robbed the ocean-voyage of its terrors. It was certainly shown in Mr. Francis’s case that, whether ungrateful or not, his own country was assuredly negligent; for it was not until long after the Old World had given him such signal honors that the United States, through Congress, paid the aged man the tribute which was his due. In 1887 he received the unusual honor of the thanks of Congress. In 1888 a gold medal was voted for his services to mankind, and on April 12, 1890, in the historic Blue Room of the White House, at Washington, this beautiful medal, the most costly one ever bestowed by the Government of the United States upon an American citizen, was formally presented to Mr. Francis by President Harrison. 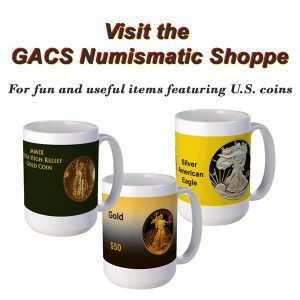 The Congress Commemorative Gold Five-Dollar Coin shows with images of the first life-car and the gold medal presented to Mr. Francis on April 12, 1890.